One of my weaknesses is Cinnamon Rolls. My mom makes the best and when she does make them, I salivate and get so excited. This cookbook is gonna make you drool. 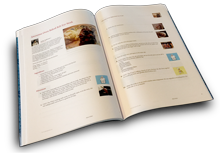 Order a professionally printed, perfect bound cookbook with a full color glossy cover and 38 recipes. No problem Lisa...It is a yummy book. I have almost 70 cooks published. I love making them. Kimi, thank you for including my recipe! I am sorry for the delay in thanking you, but (as usual) I have been on the road for work! Hope everyone enjoys it! Pat, Very well put and funny also. Thanks for sharing my recipes in your book -"your on a "roll" "
OMG! This is a wonderful idea! Thank you for sharing my recipe! I might just buy this one! What a 'sweet' cookbook! Thanks for including my recipe!